With a turtle tag! Thanks to the efforts of the Sea Turtle Conservancy (STC, (formerly the Caribbean Conservation Corporation) and other Florida sea turtle groups including many Coastal Wildlife Club members, the Florida Legislature, in 1997, authorized the creation of the Sea Turtle Specialty License Plate to provide a permanent funding source for the state's Marine Turtle Protection Program. First offered for sale in February 1998, the turtle tag quickly became one of the most popular specialty plates in Florida, raising over $1 million annually. 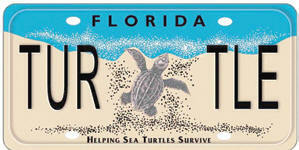 Sea Turtle Specialty License Plate revenues directly fund sea turtle conservation. 70% of annual revenues support research and management activities of the FWC’s Marine Turtle Protection Program. The remaining 30% funds research, conservation, and education projects that benefit Florida sea turtles through the Sea Turtle Grants Program administered by the STC. Do not use flashlights, tiki torches, fishing lanterns, flash photography, or fireworks. Enjoy the sand and sandcastles, but refill holes, which can trap hatchlings (and shorebird chicks). Remove canopies, chairs, toys, boats and other obstructions from the beach at night. Do ‘mini’ clean-ups daily so that trash does not entrap or obstruct the path of hatchlings and so food scraps do not attract predators. Disconnect, shield, or otherwise modify exterior lights which are visible from the beach. Remember to close draperies and also move lamps back from windows. Interior lights visible from the beach also pose a danger. Do not allow pets on the beach. Pets running loose may harass turtles, dig up nests or harm hatchlings (and shorebird chicks). Do not buy turtle products when abroad at any time. If you are fortunate enough to encounter a nesting turtle on the beach, remain quiet, at a distance, and in the dark. Allow her to return undisturbed to the sea. Lights, obstructions, and pets are threats. Join Coastal Wildlife Club! For a membership form, click HERE.